Wow, you guys just ROCK. All of your awesome replies are really incredible to see, and are inspiring. Momentum comes and goes through the life span of a project, so to see excitement this early is remarkable. THANKS!! I was really pushing QL at the ‘Con here in Indianapolis yesterday. The conversation about QL was held over dinner, and (again), so many of our friends and guests were genuinely excited to hear about this project. Writing continues between husband and horse duties, but I am pleased with what is happening. I felt that re-establishing the characters and events since Mirror Image is vital, and important in the overall story arc. NagginDragon: You think the leap effect looked better than the show’s? Wow… thanks, but I didn’t really try to improve it. Well... be careful what you wish for! Remember that the new Battlestar is vastly different from the original, and fans of the original mostly hate the new show. 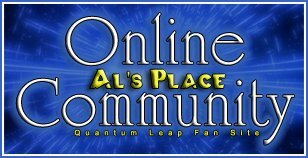 I happen to like the new BSG, but if they did a "dark reimagining" of Quantum Leap, yikes! But anyway, your point is that if someone who was involved with the original was pulling for a new show, it would be a big help. That's certainly true. The studios WILL see this because I am going to use this as a ‘pilot’ to approach SciFi, or anyone who’s willing to listen or give QL a chance once more. I finally updated RACSO's site with a page for the project... pass the word around! I added a FAQs section too, which will hopefully help. I have a question regarding something from the FAQ. You mentioned that you won't be selling this on DVD - obviously, since this is a fan production - but will it be made available on that format somehow? It's difficult for me to play things on my computer, and I'd much rather stick something in my DVD player and watch it on my TV. What if fans just pay to cover the cost of the DVD itself and the work to copy that film to DVD? Isn't that what most fanfilm makers do? Okay, I know this question is premature, but I thought I'd just throw it out there now. Good question. I put that Q&A in the FAQs to cover myself, and to make it clear that no profit is made in any way whatsoever. Studios actually employ "surfers" who lurk sites from time to time in places (STVB was visited a few times by Paramount, FOX & Warner Bros.) So that's why the FAQ was posted. But yes, I will gladly make the DVD available for us fans at cost. I did that for STVB as well, so worries! I agree that watching material on a computer is far more different than a TV! I'm not sure about the sensitivty there was a film made about Princess Di's death last year (The Queen) and it was liked and got an award. Plus it's been ten years this year. It was a major wrong and sounds to be a great story. Good luck! Why do all the cool things happen in the states? I know what would be cool! Watching it at QL con in 2009! That would be awesome, but I don't think I could wait that long to see it but it wouldd be a great con treat to hve it on a big screen. ----ooops!!! Just read the FAQ!!! Great minds think alike! Anyhow can't wait to see it! Last edited by Janna Galaxy; 07-21-2007 at 05:11 PM. Thanks for the well wishes, Janna. I'm just about done with the first draft of the script, and have been SWAMPED by fans requests for a lot of different things. Its great to know this is quickly becomming an anticipated event at Leapback!! Man, I didn't think it would take off this quickly... everyone who has heard about it e-mails me saying how much they loved the show... Let's hope this can bring out the armies of fans!! *I found my Sam!! And his name is... *ahem* Scott!! Oh, we're all there...lurking in the shadows! I'm glad you found your Sam. I'm not going to say anything else, I've not got my glasses on and I need my medication. Plus it's bed time....stop the excuses...sorry...night! Hopefully, I'll have this finished (first draft) here shortly, and then begins the planning (pre-production) stages. I know we'll be building a control room set!! I can't wait for that!! Thanks for all the links and visitors to our website! I'm glad to hear it's advancing so quickly! I'm a little wary about seeing a new Sam, though; it's hard to imagine anyone besides Scott Bakula in the role. Yea, you know where this is going. I'm with you LadyKayoss... I know seeing a new Sam will be difficult. But its a bullet I gotta take because I don't think I could talk (or even pay) Mr. B. into doing it. Its not like Star Trek where we've seen hundreds of guys do Kirk... this is much much different. All I can say is that I'll keep the spirit and energy of Scott and Dean in my mind as we shoot this... that much I can promise you. Back to writing... or re-writing in my case. Ah the hard won lesson - back-up, back-up, back-up and then back-up your back-up! Now all my writing is saved in at least three distinct places, preferrably stored seperately as well. I don't know which version of "Word" you are using (I'm a Mac user myself but I'm sort of assuming you are a PC user, though Word is similar in both) but try right mouse click on the document icon and go to properties. One of the tabs should offer you 'previous version', which should take you back to the last but one save. See which dates it offers you. Take it back to the newest one you know was ok. It will have lost some of the work, but better than starting from scratch! Ugh, I hate when that happens - especially when the document in question is a term paper or a particularly long chapter of a story. I've been able to recover documents, but often lose some of my best stuff. My worst incident involved a chapter I spent months working on to finish. I had ten pages complete (I had no free time, so ten pages was quite an impressive feat) and then the file got corrupted and I was only able to save the first three pages. None of it my most inspired work. *sigh* There needs to be a support group for us. And yes, I, too, learned to back up my stuff multiple times. Oh, I know... And I think if there had been other QL fan films where we could adjust to the idea of a different Sam and Al, it wouldn't be such a difficult concept. But I'm definitely willing to give it a try, as long as the spirit of the show is there. I've seen fan films so good that I've forgotten that the actors aren't the ones I'm accustomed to. Chris, I just wanted to say that I have had that happen as well. Like you, I had everything written out, so it only took about seven hours to retype it all. Mine was a case of a floppy disk getting eaten by the disk drive. I print everything as a backup now. Please continue to keep us posted on the happenings of your film! Last night, I typed out a nice lengthy reply to all of you who felt my "FILE CORRUPTED" pain, and BAM… I submit it, and I timed out. Man… some days I just can’t win. I forgot what I wrote, but it basically said, "thanks for sharing your war stories". So I lost my ‘thunder’ from last night, as I was too tired to try and repeat my post. The fantastic ability I always get when I write beyond an hour is momentum, and that sparks my creativity… and that’s what I had happening on several occasions before it crashed. LadyKayoss, I’m with you on the re-casting concept. It’ll be a difficult task, but I feel I have a fairly decent "lock" on what I am looking for Sam and Al… I have one strong candidate for ‘Sam’, but want to see what else is out there before I offer it to him. I might hit the talent pool in Chicago just as a preliminary inquiry… I’ve had lots of luck in Chicago in my past films. Depending on how far you’re from Indianapolis LadyKayoss, you would be more than welcome to attend our auditions. Or anyone for that matter. Lord knows I could use another voice in the casting process. Just throwin’ it out there. Between now and the 19th, I’ll be getting more and more busy on my last time travel feature we’re wrapping up between the 13th & 17th. I originally had hoped to have my QL script ready before we finished pick ups, but nope. Oh well… worse things can happen. Thanks for all the interest everybody. You all are so nice. I LOVE it here!! Having no experience with fan movies (or films of any kind) I doubt I could do more than just walk around in the background and pretend like I don't see the camera. But I'd love to participate in some way and, heck, I'm free slave labor. As for how far I am... well, it looks like I just managed to find the silver lining to being stuck in Michigan for another year. Thanks, Ziggy's Ego!! That's very nice of you, sir! This is certainly something I can look forward to. Will you provide the fanfilm on the internet? I'm always bogged down with work, be it at the office or at home. Very nice work with the trailer, by the way. I write long replies in Notepad and then copy-paste them to forums. That way if something goes wrong, I still have a copy. As for hte script, hope you have stocked up on thumb drives. 1GB for $20. Really excited to hear about this project and hoping for the best. Sorry for the long absence. I just finished shooting our feature last week (also a time travel story, and am decompressing this week. Now I can get back to writing the QL project, which I am anxious to get back to. We had a great shoot, and were able to learn a lot from our Director of Photography, which are valuable lessons we can apply to the QL project. Check out some of the examples from our shoot! They were awesome! WOW. Just watched the trailer, and man, that was amazing. The lighting, the atmosphere, the camera angles... So wonderfully professional. I didn't think I could be any more excited about the QL project, but seeing this really makes me eager for the QL film! Thanks again, everyone! You all are so nice!